LA JOLLA—Salk researchers have discovered how to curb the growth of cancer cells by blocking the cells’ access to certain nutrients. The approach, detailed in a new paper published today in Nature, took advantage of knowledge on how healthy cells use a 24-hour cycle to regulate the production of nutrients and was tested on glioblastoma brain tumors in mice. “When we block access to these resources, cancer cells starve to death but normal cells are already used to this constraint so they’re not affected,” says Satchidananda Panda, a professor in the Salk Institute’s Regulatory Biology Laboratory and lead author of the paper. The circadian cycle, the intrinsic clock that exists in all living things, is known to help control when individual cells produce and use nutrients, among many other functions. Scientists previously discovered that proteins known as REV-ERBα and REV-ERBβ are responsible for turning on and off cells’ ability to synthesize fats, as well as their ability to recycle materials—a process called autophagy—throughout the day. In healthy cells, fat synthesis and autophagy are allowed to occur for about 12 hours a day when REV-ERB protein levels remain low. The rest of the time, higher levels of the REV-ERB proteins block the processes so that the cells are not flooded with excessive fat synthesis and recycled nutrients. In the past, researchers developed compounds to activate REV-ERBs in the hopes of stopping fat synthesis to treat certain metabolic diseases. 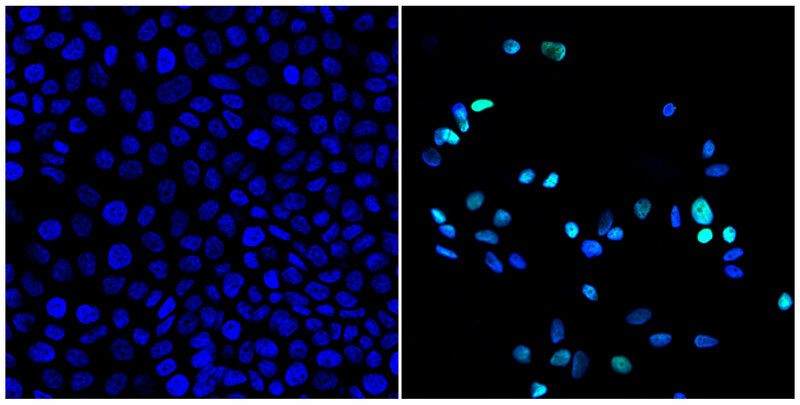 At left, tumor cells shown before treatment with a drug to activate the circadian clock. At right, a greatly reduced number of tumor cells after drug treatment. Green color at right indicates dying cells. Panda and his colleagues wondered whether activating REV-ERBs would slow cancer growth, since cancer cells heavily rely on the products of both fat synthesis and autophagy to grow. Panda then went on to test the drugs on a new mouse model of glioblastoma recently developed by Inder Verma, a professor in the Salk Institute’s Laboratory of Genetics. Once again, the REV-ERB activators were successful at killing cancer cells and stopping tumor growth but seemed not to affect the rest of the mice’s cells. Verma says the findings are not only exciting because they point toward existing REV-ERB activators as potential cancer drugs, but also because they help shine light on the importance of the link between the circadian cycle, metabolism and cancer. Verma says his group is planning follow-up studies on how, exactly, the REV-ERB activators alter metabolism, as well as whether they may affect the metabolism of bacteria in the microbiome, the collection of microbes that live in the gut. Panda’s team is hoping to study the role of other circadian cycle genes and proteins in cancer. 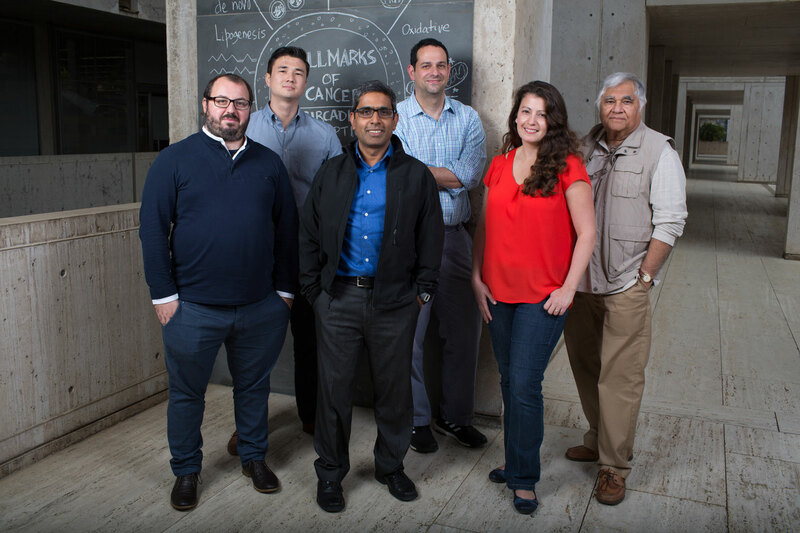 Panda, Verma and coauthor Alan Saghatelian, also a Salk professor, are all members of the Salk Cancer Center, a National Cancer Institute–designated basic research cancer center. Other researchers on the study were Amy Rommel and Matthew J. Kolar of the Salk Institute; Xiaojie Wang and Maksim V. Plikus of the University of California, Irvine; and Francesca Puca of The University of Texas MD Anderson Cancer Center. The work and the researchers involved were supported by grants from Worldwide Cancer Research, the National Institutes of Health, the Pew Charitable Trust, the National Cancer Institute, the American Federation of Aging Research, the H. N. and Frances C. Berger Foundation, the Glenn Center for Aging Research, The Leona M. and Harry B. Helmsley Charitable Trust, the Istituto Superiore di Sanità and AIRC Associazione Italiana per la Ricerca sul Cancro.